Outdoor banners help guide your community to your church, welcome new visitors, and show them where to go once they arrive on your campus. 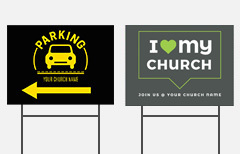 We have church banners for all your outdoor needs, including outdoor vinyl, feather flags and teardrop flags, yard signs, pole banners, handheld welcome signs, sandwich board street signs and more! 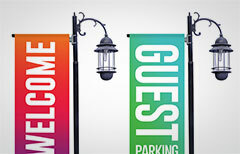 Choose one of our stock designs or create a custom banner to provide a warm welcome for your guests before they even step foot in your church. 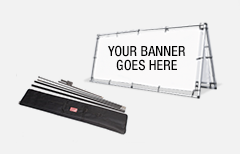 Want a completely custom church banner?